Snikiddy®, a line of all-natural snacks made from simple, real-food ingredients, announced a fresh new look for its line of Eat Your Vegetables® chips at the Summer Fancy Food Show. The chips now feature even more vegetables, including the superfood, kale. In addition to integrating kale into the new recipe, Eat Your Vegetables are now made with broccoli, spinach, tomatoes, sweet potatoes, carrots and shitake mushrooms, providing a full serving of vegetables in every 1-ounce serving. The new snacks also feature fresh, redesigned packaging with a clean look that highlights the new added ingredients. With a full serving of vegetables in each ounce, Eat Your Vegetables are a good source of vitamin A, C, E, B1, B6 and antioxidants. The chips also provide 3 grams of fiber and 3 grams of protein per serving from a proprietary blend of beans and brown rice. Like all other Snikiddy snacks, Eat Your Vegetables are all-natural, certified gluten- and wheat-free, made with non-GMO ingredients and are completely peanut and tree nut-free. Snikiddy Eat Your Vegetables are available in fun, family-friendly flavors including: Sea Salt, Sour Cream & Onion, Jalapeno Ranch, Italian Herb & Olive Oil and Sea Salt & Lime. The new packaging will begin hitting shelves nationwide by the end of August; however, bags featuring “Now with Kale” stickers are already being shipped to retailers. Snikiddy snacks are available at grocery, natural, specialty and family retailers nationwide, including select Target locations, Sprouts Farmers Market, The Fresh Market, Whole Foods Market, Toys ‘R’ Us, and Babies ‘R’ Us as well as online at Snikiddy.com. This entry was posted in Branding & Packaging, Healthy Choices, Produce, Snack foods, Trade shows and tagged SFFS13, Snikiddy, vegetable chips on July 3, 2013 by lorrieb2013. Chosen from a record number of 2,573 entries submitted into 32 award categories, Sarabeth’s Legendary Velvety Cream of Tomato Soup won the sofi™ Gold Award in the Soup, Stew, Bean or Chili category. The 41st Annual Awards, held at the Jacob K. Javits Convention Center in New York, were presented at a red-carpet ceremony hosted by Chef Marcus Samuelsson. A national panel of food professionals met over eight days to select 125 finalists, then more than 150 buyers at the Summer Fancy Food Show tasted and tested the finalists to determine their favorites in each category. The results were tabulated by an outside accounting firm on July 1, prior to the ceremony. Sarabeth has been awarded multiple sofi™ awards including the “Outstanding Classic” Gold award for her Blood Orange Marmalade in 2009 and the Gold award in the “Hot Beverage” category for her Hot Chocolate Parisienne in 2008. Sarabeth Levine also launched her newest products, the all-natural Perfect Pancake & Waffle mix and Blueberry Mango jam at this year’s exhibition. This entry was posted in Prepared Meals and tagged Sarabeth's, SFFS13, sofi, soup on July 3, 2013 by lorrieb2013. SPINS, an information and service provider for the natural and specialty productsiIndustry, has announced a new partnership with Oliver’s, a leading independent grocer with a growing chain of stores in Sonoma County, California. The two companies will collaborate to provide Oliver’s with information and resources for the specialty and gourmet grocery channel. Oliver’s Markets is a locally owned and operated retailer that has been providing quality foods for nearly 25 years. While it prides itself on being unique and offers its shoppers award-winning gourmet fare, Oliver’s also provides a full line of natural and conventional groceries, organic produce, and locally produced products from Sonoma County’s growers and manufacturers. The retailer was named a Specialty Food Association’s Outstanding Retailer of the Year and was noted for its ability to differentiate itself by catering to a broad audience through its extensive mix of products. By uniting with SPINS and endorsing the development of SPINS’ Specialty Gourmet grocery channel POS reporting service, Oliver’s will advance its knowledge of the natural, organic, and specialty products arena, while leveraging SPINS’ industry expertise to better support its stores. This entry was posted in Specialty Foods Retailers and tagged Oliver's, SPINS on July 3, 2013 by lorrieb2013. Market Street invites guests to discover amazing flavors made or grown in Texas during its annual Best of Texas expo taking place each weekend in July. The event will feature top products from the Lone Star State at all 11 Market Street locations in north and west Texas. Best of Texas attendees and guests will have the opportunity to sample appetizers, entrées and desserts made from products grown and produced throughout Texas. Guests will also enjoy product demonstrations, and Market Street team members will be available each weekend throughout the month to answer questions and provide recommendations. “Market Street has a rich Texas history and is proud to spotlight the high quality products grown and produced throughout our state and available in our stores,” said Wes Jackson, chief merchandising officer for United Supermarkets, LLC, parent company to Market Street. This entry was posted in Specialty Foods Retailers and tagged adrino Tamales, Beanitos, Becker Fascination, Day Break Coffee, Deborah Kayes Cookies, Ed’s Smooth Red, Eddie’s Smoked Sausage, Fall Creek Chenin Blanc, Fischer & Wieser, Llano Tempranillo, Mateo’s Salsa, Messina Hof, Mrs. Renfro’s, Opas, Outlaw Red, Primizies, Promised Land, Red Fajitas, Rhythm Kale Chips, Scoops Ice Cream, Smokehouse Ranch, Sticky Toffee Pudding, Texas Tamale Company, Texas Tea, Third Shift, Twin Springs Sweet Red, Whole 5, Wicked Beaver, Ziegenbock on July 3, 2013 by lorrieb2013. Mom Made Foods, producer of frozen prepared meals, snacks and meal starters for kids, is offering new products in SuperTarget stores, throughout the country, with the launch in stores July 2013, the company announced from its headquarters in northern Virginia. 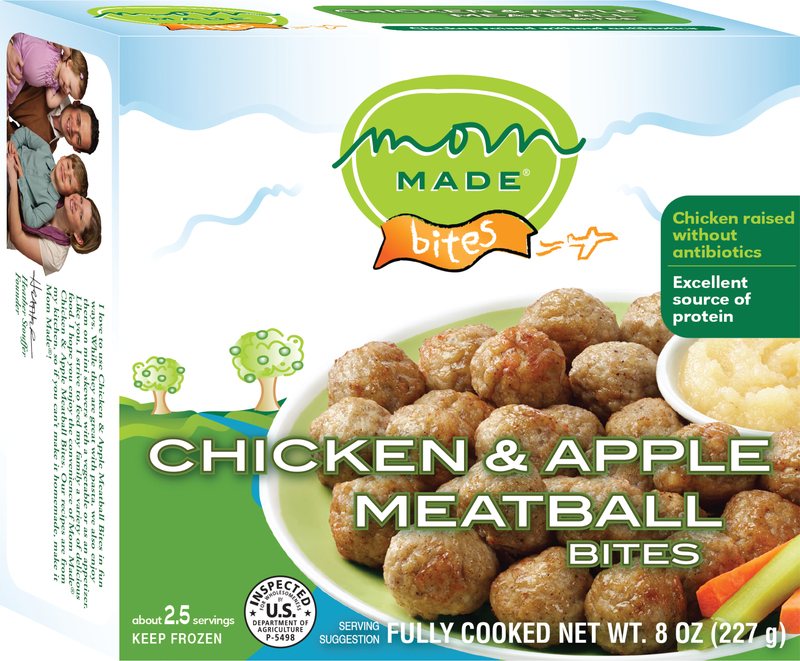 The five different Mom Made Foods entrees now available include Mom Made Meals in organic Spaghetti with Turkey Meatballs, Mom Made Munchies in organic Cheese Pizza, and Mom Made Bites in Chicken & Apple Meatballs, Beef & Cheese Meatballs and Turkey Meatballs varieties. 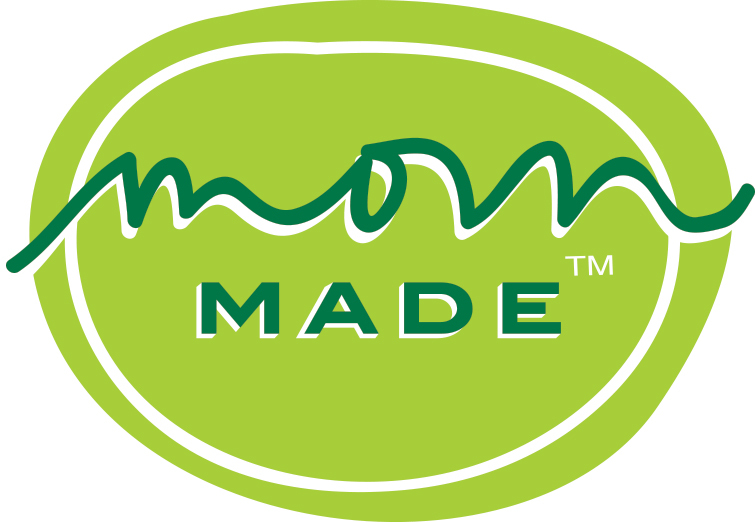 All Mom Made foods are packed with healthy vegetables and grains, are full of flavor and have no added preservatives. They give parents a convenient, guilt-free way to provide their kids with the food they love. In addition to expanding the Mom Made Foods product line sold in SuperTarget stores, coupon booklets will be handed out to SuperTarget guests nationally on July 1. A coupon will be included for $1 off for customers who buy a combination of any two Mom Made Foods Meals, Munchies or Bites. Mom Made’s nutritious frozen meals and snacks give parents a guilt-free, convenient way to feed kids foods they love that are good for them. The company’s three product lines are flash frozen to preserve flavor, nutrients, color and natural texture. They contain no preservatives, are GMO free, no trans fats, no added sugars (except for Apple Pie), no artificial colors and are lower in sodium than their conventional counterparts. All meat items are antibiotic-free. The midatlantic’s first USDA-organic certified producer of frozen foods for children, Mom Made is available nationwide in select stores such as Duane Reade, A&P, Waldbaum’s, Food Emporium, Whole Foods, Hannaford, Sweetbay, Shaw’s, ShopRite and more local chains and independent stores. This entry was posted in Healthy Choices, Prepared Meals and tagged children's meals, Mom Made Foods, Prepared Meals, SuperTarget on July 3, 2013 by lorrieb2013. No matter how exhausted you are on this last day of the Summer Fancy Food show, make the time, find the will, to race down to Javits North for the chance to wrap your lips around some of the most sublime tastes on the planet while also basking in the glow of newly-minted sofi Gold Awards. It’ll make you forget that your feet hurt and your back is sore. De Angelo and her husband Alan are in the booth this morning sampling the prize-winning Cherry Seed Oil along with the Pumpkin Seed Oil, Chile Seed Oil and Tomato Seed Oil that comprise the rest of the line. Stop by for a taste and a quick lesson from Marietta on how to use and how to sell these oils. You’ll find the sofi Gold Award for this year’s Best Chocolate just a few feet down the same aisle at Chocolat Moderne’s booth # 5116. 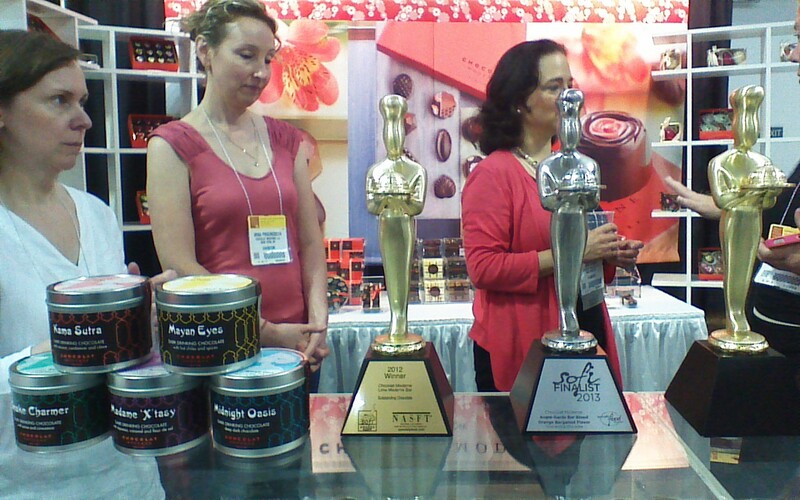 Chocolat Moderne is getting used to being on the sofi award stage after winning two consecutive gold awards. This year’s winner was the Avant-Garde Bar in Blood Orange Bergamot flavor, while the Lime Moderne Bar won the gold award last year. The Blood Orange Bergamot offers up its floral notes first, followed by the exhilarating citrus burst of the blood orange and finishing with the aphrodisiacal chocolate notes. The Lime Moderne Bar, on the other hand, offers up its chocolate flavor first and finishes with sweet lime notes. This entry was posted in Chocolate, Confections, Oils, Trade shows, Uncategorized and tagged Chocolat Moderne, SFFS13, Stoger Seed Oils on July 2, 2013 by lorrieb2013. Beaverton Foods is here taste-testing some new products that aren’t quite ready for public release yet, and they accidentally left them where I could steal a look, if not a taste. There’s a Cholula HR Sauce, a Smokey Sweet Potato Fry Sauce, and a sauce labeled Sriracha Wasabi, which is probably all the information about those that we’re going to get, except that I have learned that those three are the brain children of Domonic Biggi, Beaverton Foods President. He’s the third generation to be practicing his craft at Beaverton Foods. He combines a knowledge of his family traditions with an inventive spirit, and he’s actively involved in product development. 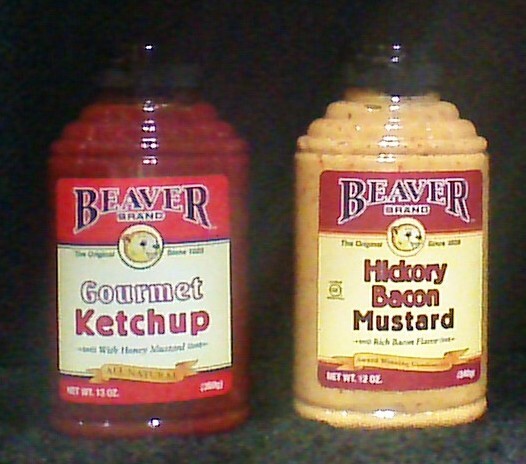 Beaverton Foods products new to the market this year include Inglehoffer Seafood Cocktail Sauce, Inglehoffer Applewood Smoked Bacon Mustard and Beaver Brand Gourmet Ketchup. The Gourmet Ketchup was developed two years ago, while the Inglehoffer Applewood Smoked Bacon Mustard came to market just last year and is rapidly growing in popularity. 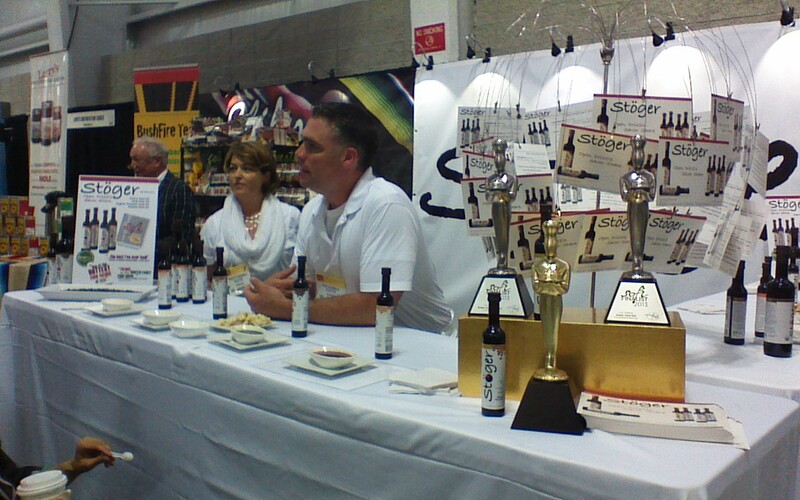 The seafood cocktail sauce was developed several months ago and is just now arriving in markets. The Inglehoffer Seafood Cocktail Sauce has freshly grated horseradish inside for a tangy bite from real ingredients. The cocktail sauce and the Beaver Brand Seafood Tartar Sauce are made with the same kind of care and ingredients that consumers use when they make similar products at home from scratch, says Jeffrey Biggi, Foodservice Sales Manager for the company and fourth-generation family member in the business. Beaverton Foods is booth #1480 at the Fancy Food Show, and then after the show, you can find them at www.beavertonfoods.com. Jeffrey is the mastermind behind the company’s social media efforts, so you can find both Beaver and Inglehoffer brands on Twitter and Facebook. Search for Beaver Brand and Inglehoffer. This entry was posted in Condiments, Mustard, Sauces and tagged Beaver Brand, Beaverton Foods, Inglehoffer, mustard, SFFS13, tartar sauce on July 1, 2013 by lorrieb2013. 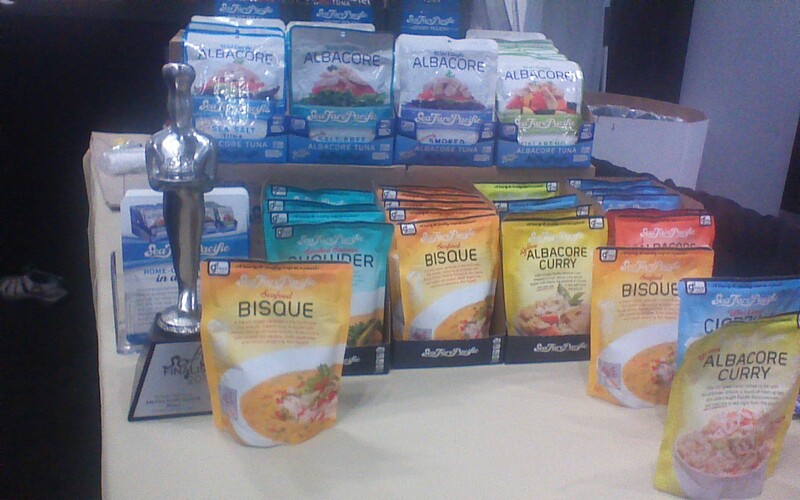 Oregon Seafoods is in booth #1550 with Sea Fare Pacific, brand of seafood items including fish pouches and seafood-based soups and sauces, all shelf-stable. A fish pouch replaces a can. They’re BPA free, and the shorter cook times necessary for packaging in the pouch result in a product that’s better-tasting and has a better texture than the canned equivalent. Oregon Seafoods uses a once-cooked tuna process, which means that all of the fish are filleted by hand at ice-cold temperatures, put in a pouch and cooked only once. That process allows the fish to retail all its natural juices and oils, which are rich in Omega-3s. All twice-cooked canned tuna products have only one-sixth as much of the native Omega-3 oil that’s found in the pouched Sea Fare Pacific tuna. Soups and sauces were developed by Mark Witham at Seagrant Oregon, which is part of Oregon State University’s research facility in Astoria, Ore., which is working to promote Oregon’s seafood as a product that’s competitive in the world marketplace. The soups and sauces are low-sodium, gluten-free, non-GMO products with seafood that was wild-caught in a sustainable fishery. The products are shelf-stable with a two-year shelf life. Cooking time is less than with canned products; it’s microwaveable and boilable, so consumers have many options for turning the pouch into a hot meal. The products are available at retail in more than 800 stores in the western U.S. already, and the distribution network is growing rapidly as the product becomes better-known. Visit after the show at www.oregonseafoods.com and http://www.seafarepacific.com. Facebook at /seafarepacific and Twitter @seafarepacific. This entry was posted in Uncategorized and tagged Oregon Seafoods, seafood, soup on July 1, 2013 by lorrieb2013. The Summer Fancy Food Show vendors offer a world of choices for buyers who want to make healthy choices while they’re indulging their appetites for quality foods. Whether they’re looking for sweet confections, savory appetizers or hearty foods that they can feel good about serving at the family dinner table, you’ll find what they need this week at Jacob Javits Convention Center. Hillside Candy in booth #347 has sugar-free, organic and sugar-based candies. GoLightly sugar-free candies are sweetened with Splenda. Thirteen different varieties are a safe choice for diabetics. The Go Organic line includes nine SKUs that are organic and non-GMO-certified. New at this show are the Ginger Xtreme hard candies and Ginger Chews organic chewy candies. All products are kosher, gluten-free and made in the USA. Visit at http://www.hillsidecandy.com. The Silver Palate in booth #536 has a new Grain Berry brand of cereals and baking mixes made with natural berries of grain and antioxidants to support heart health. http://www.silverpalate.com. Enjoy Life in booth # 654 is offering allergy-friendly, gluten-free baking chocolate, cookies, chewy bars and lentil chips. They’re all convenience-oriented products. http://www.enjoylifefoods.com. In 868 Eastland Food Corporation, based in Maryland, is talking about rice bran oil as a healthy choice. Rice Bran Oil is high in oryzanol and Vitamin E, natural antioxidants, and has a high smoke point, so it can be used for frying as well as in baking and in salad dressings. It’s made from non-GMO rice bran. http://www.eastlandfood.com. Melt organic is offering spreads that take the place of butter. They’re made with virgin coconut oil and can be used for sautéing, baking and spreading, like butter but with half the saturated fat and calories. A chocolate flavor is new on the market, while rich and creamy and honey spreads have been out for about 18 months and are meeting great acceptance. “That’s the only butter improvement that actually tastes like butter,” says Meg Carlson, President and CEO of Prosperity Organic Foods, the maker of melt Organic. Booth #1445 and http://www.meltbutteryspread.com. Suzie’s brand of crackers is made by the Good Groceries Company. Suzie’s Baby Biscuits are gluten-free, rice-free and sweetened with fruit juice. Suzie’s Saltines are made with ancient grains, including quinoa, amaranth, Kamut, spelt, buckwheat and oats. 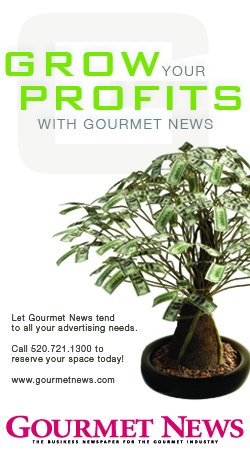 Find them in booth 3920 and at http://www.goodgroceries.com. Snapz is a brand of freeze-dried apple snacks. These low-calorie, fat-free crispy treats are made without added salt, sugar or fat. There’s a serving of fruit in each .7-ounce bag, and they’re a source of Vitamin C. Visit in booth #4175 and at http://www.snapzcrisps.com. And lastly, the folks from Bob’s Red Mill are here at the show to take care of the folks who want to make their healthy choices from scratch. The Nine Grains-of-Discovery line is new to the market. This line includes nine products, of which five are gluten-free. Your favorite ancient grains are represented in the collection, including quinoa, teff, spelt, Kamut, farro, amaranth, millet, sorghum and chia. Find them in booth #4155 or at http://www.bobsredmill.com. This entry was posted in Chocolate, Confections, Grains & Flours, Oils, Snack foods, Trade shows, Uncategorized and tagged Bob's Red Mill, Enjoy Life, gluten-free, SFFS13, Silver Palate, Snapz, Suzie's on July 1, 2013 by lorrieb2013. If the Summer Fancy Food Show offers nothing else (And how could it possibly offer nothing else? ), a visit would be worthwhile just for the wealth of holiday season ideas on display. There’s everything on the show floor to tempt your customers in for their entertainment and gift needs. Here’s just a sampling of the holiday season treasures to be seen in the exhibit hall. Mom ‘N Pops in booth #142 has lollipops decorated for the holidays. 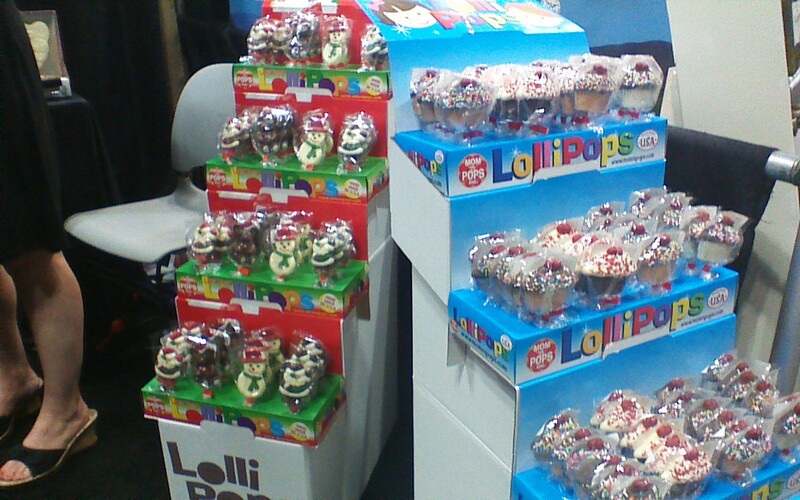 The lollipops are all hand-made in New York and are available in counter displays, counter displays and in bulk. All are certified kosher. Visit at www.momnpops.com. For an easy appetizer, just mix any of a variety of Robert Rothschild Farm savory sauces like the Hot Pepper Raspberry or Pineapple Habanero. Just take a block of cream cheese, pour the sauce over it, and set it out with crackers, according to Chef Kathryn Scott, who was in booth #236 demonstrating Berry Lemon Tiramisu made with Robert Rothschild Farm Mixed Berry Preserves, lemon gelatin and cream cheese. Visit www.robertrothschild.com. Kentucky Woods Bourbon Barrel Cake in booth 751 is a 50-ounce brown sugar cake with maple, caramel, walnuts, chocolate and aged Kentucky Bourbon. The cakes are shipped frozen on a pallet and have a 28-day shelf life. www.kentuckywoods.com. Chocolate Preserves or Red Pepper Jelly packed in authentic European drinkware make a fabulous hostess gift. The Red Pepper Jelly is up for a sofi award in the Outstanding Classic category, and the Chocolate Preserves is brand-new on the market. There are five varieties, including Chocolate Tart Cherry and Chocolate Strawberry Preserve, which have become instant hits. See them in booth #1646 or visit www.braswells.com. Supreme Chocolatier in booth #1836 has foil-wrapped Santas, holiday ornaments and Christmas trees as well as boxed chocolates. Visit www.supremechocolatier.com. 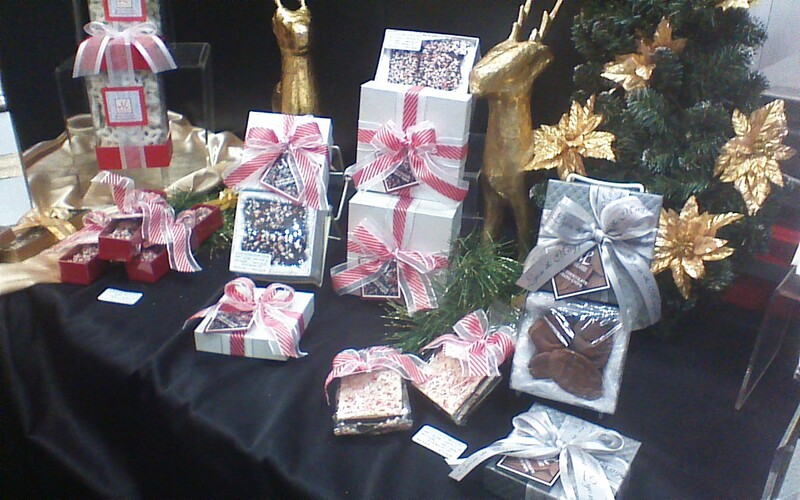 It’s Christmas all over the Maggie Lyon Chocolatiers booth #2146, where chocolate-covered pretzel rods are bedecked with red floral ribbons and Milk Chocolate Potato Chips are offered in silver gift boxes. www.maggielyon.com. Aspen Mulling Spices offers the spice mixes for the classic holiday cider and eggnogs as well as holiday bread and muffin mixes. They’re in booth #2251 during the show and at www.aspenspices.com. This entry was posted in Beverages, Branding & Packaging, Chocolate, Sauces, Seasonings and Spices, Trade shows and tagged candy, gift ideas, holiday, jams, preserves, SFFS13 on July 1, 2013 by lorrieb2013.